Master the amazing practice of Kundalini Yoga from the teachings of Yogi Bhajan. Presented by Nirvair Singh Khalsa in the comfort and privacy of your own home and the convenience of your schedule. Easy set of loving instructions help you quickly feel the immense benefits of this accelerated yoga practice! Tens of thousands of students have already reaped the benefits of this fantastic course. Now you can join them! Do you want to feel great results in as little as 5 to 11 minutes? Then don't leave this page. Now, working in the privacy of your own home, you can improve your health and see benefits in as little as a few hours per week, through the simple, natural and proven methods of Kundalini Yoga presented in Nirvair Singh's highly acclaimed Kundalini Yoga for Beginners Course. It provides both beginners and more experienced practitioners a complete library of Kundalini basics from the Breath of Fire to deep relaxation techniques. Nirvair Singh is a university instructor and has taught classes in Kundalini Yoga at the University of Alaska, Anchorage since 1975. In his 30 year teaching career he has taught over 11,000 classes attended by over 275,000 students. His classes have had consistently the highest positive student evaluations in his college. Nirvair began to study with Yogi Bhajan in 1970, and has taught seminars, classes and retreats all over the United States and around the world. Yogi Bhajan honored Nirvair Singh for his exceptional service with the title of Mukhia Singh Sahib (Chief Noble Lion) in April of 2001. He currently serves on the Board of Directors of the International Kundalini Yoga Teachers Association and is the Coordinator of Teacher Training in North America for the Kundalini Research Institute. He has personally authored fourteen videos and four books on Kundalini Yoga, many of which are available from Yoga Technology. Originally broadcast as an accredited telecourse by the University of Alaska, we are pleased to make available this superb and highly practical home study course to a world-wide audience. The course includes twelve 1-hour video classes on 6 DVDs. Review of slow deep breath, Breath of Fire, clearing and exercise combination breath. Feel better from the first day! Learn the Kundalini practices as they were taught by Yogi Bhajan who brought them to the West in 1969. These practices have evolved over many centuries and they will powerfully work the connection between your spiritual, mental and physical health. Secretly taught and handed down through the ages by yogis before being taught in the West, Kundalini Yoga is a dynamic practice easy to learn but powerful in its results. Create your own peace of mind, mental clarity and wellness with your own coach and trainer! If you took this instruction in a yoga studio, it could cost you up to $1000, and you wouldn't even have the recordings for future reference and review! 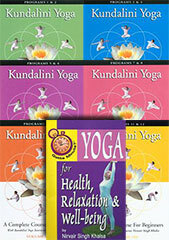 This world renowned set of instructions has become the benchmark for Kundalini Yoga for Beginners. This learning system has been taught to 1000's of people just like you with no special training or yoga experience! View Beginners Course Contents - Click Here! Normally the Kundalini Yoga for Beginners Set of DVDs would sell for $168 (plus shipping) if purchased separately or in bookstores. Today Yoga Technology is offering all 12 Kundalini Yoga for Beginners lessons on 6 DVDs for one low price of $99.95 (a saving of $68!). (See our total satisfaction guarantee at the bottom of this page). and this is not all. As your special bonus we will include a copy of Kundalini Yoga for Health, Relaxation & Well-being by Nirvair Singh completely free of charge with every set of Kundalini Yoga for Beginners that we ship. This $12 book, filled with Nirvair's wonderful collection of fast, simple techniques, guides you through common daily challenges successfully and easily - with healing exercises to do in the morning, at your desk, in your car, and before bed. OR, are you looking for even more - to go to the next level, to venture deep within to totally transform your daily life? We have a truly special offer for you. Working with Yoga Technology, Nirvair has recently developed the most comprehensive home study course on Kundalini Yoga available today, the Complete Course in Kundalini Yoga. The material offered in the Complete Course covers all the requirements for Kundalini Yoga for Beginners, but will also take the serious student up to the next level. This course is only available from Yoga Technology! Additional DVD - Walk Tall with Kundalini Yoga - Nirvair will teach you to balance the lower back and hips to walk tall and move forward in your life at all levels. Including music from Shanti by Snatam Kaur. Additional DVD - Kundalini Yoga for Grace & Prosperity - Experience a kriya that will completely prepare you for deep meditation. Both fun and effective - Nirvair will teach you how to create balance, elevation, relaxation and the grace in your current state of being. Featuring music from Prem by Snatam Kaur. Nirvair will guide you through a prosperity meditation to reduce all negativity, past and present, smooth out day-to-day problems and create a positive tomorrow. Nivair's wonderful book - The Art, Science and Application of Kundalini Yoga - 4th edition, 2015, alone worth $60 - a comprehensive and superbly illustrated lifelong reference that can be used by student and teacher alike. Nirvair has produced what can only be described as the definitive guide to Kundalini Yoga as brought to the West by Yogi Bhajan. View Complete Course Contents - Click Here! 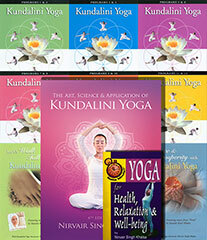 Nirvair has created the Complete Course in Kundalini Yoga for home study. This exclusive collection is only available only from Yoga Technology. You won't find this anywhere else. Order Today! And, as a special bonus to you, we will add a copy of the book, Kundalini Yoga for Health, Relaxation & Well-being by Nirvair Singh completely free of charge. This book, filled with Nirvair's wonderful collection of fast, simple techniques for Kundalini Yoga for Beginners, guides you through common daily challenges successfully and easily - with healing exercises to do in the morning, at your desk, in your car, and before bed. Take advantage of this risk free promotion! You won't be sorry! If you are not completely satisfied with either your Kundalini Yoga for Beginners or your Complete Course, please return the course to us within 14 days of receipt for a full refund! Your satisfaction is our concern and it is guaranteed. Please keep the free bonus book as our gift to you. For any questions, comments or suggestions of a technical nature, please contact Webmaster. We would especially appreciate reports of any problems you may experience while accessing this site. All access to this Website is subject to your compliance with our Terms & Conditions of Use. All our products have been approved by Guru Rattana, Ph.D., for the purposes of instruction in, and the daily practice of, the ancient and time-tested technology of Kundalini Yoga. They reflect her own unique perspectives and insights, inspired by a lifetime study of the teachings of Yogi Bhajan, and of Sikhism and other spiritual disciplines. This site is updated on a daily basis. Copyright © - Yoga Technology, LLC. All Rights Reserved.